More about Marimekko Rasymatto Oiva 10 Year Anniversary Coffee Cup This special edition coffee cup celebrates the 10 year anniversary of the Marimekko Oiva collection. 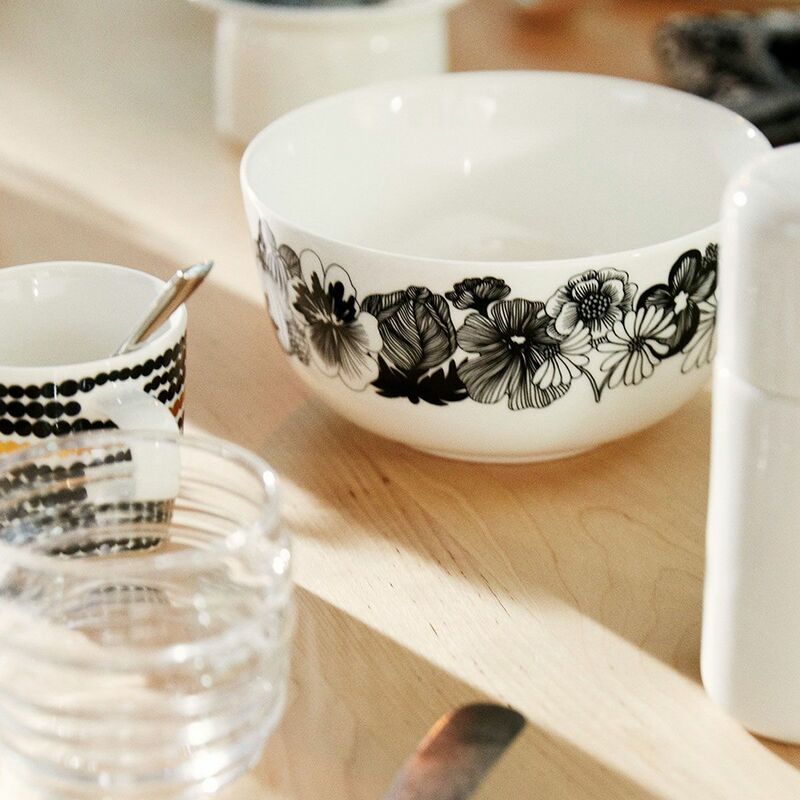 Designed by Sami Ruotsalainen, the decade-old dinnerware collection has become a staple of the Marimekko brand and design-lover's households. Its clean lines, modern form, and functional features makes it the perfect canvas for Marimekko's bold prints. Here, that striking pattern is Maija Louekari's Räsymatto (Rag Rug) which was inspired by the handmade textiles typically found in Finnish summer cottages. 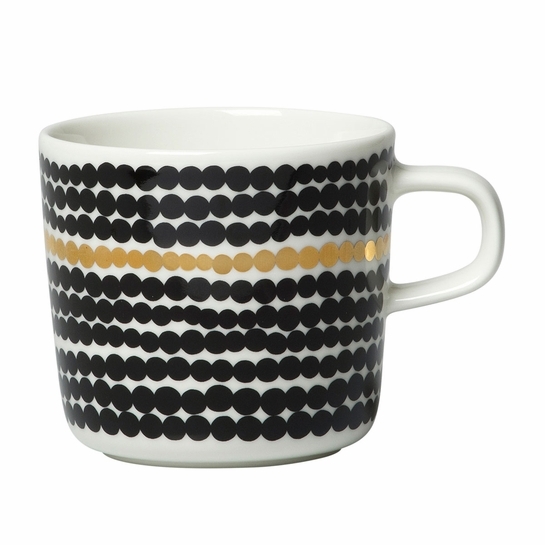 A row of golden dots adds metallic contrast to the otherwise black, intentionally-imperfect polka dots. The same gold accent can be found on the base, where a 10th anniversary commemorative stamp reminds you of its special story. This stunning, hand-painted detail gives this everyday dinnerware the beauty of more formal china. 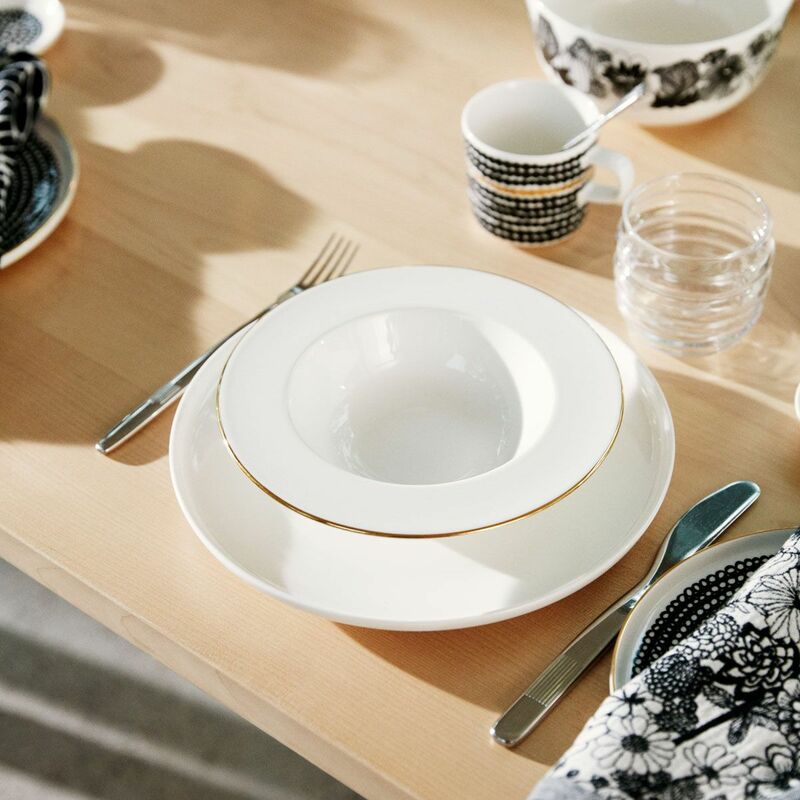 While Oiva dinnerware is loved for being microwave, oven, freezer, and dishwasher safe, these special edition pieces should only be hand washed and not used in the microwave to preserve the hand-painted gold trim. In addition to loving the modern Finnish designs, I am very drawn to the older Finnish designs. This cup is elegant and reminiscent of an earlier era. I am delighted! The cup was obviously packed with care.